SINGAPORE, 18 November 2014 - Labuan International Business and Financial Centre (Labuan IBFC) and the Financial Times today hosted the ASEAN Wealth Management Summit 2014 at the InterContinental Hotel in Singapore. 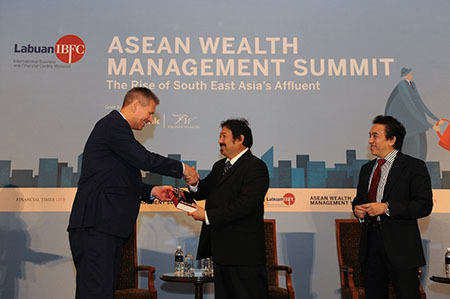 Titled “The Rise of South East Asia’s Affluent”, the Summit provided a special focus on the future of ASEAN’s wealth management industry in view of the remarkable growth of wealth and greater economic integration in the region. “The wealth management industry, within the ASEAN local financial institutions, is still very much in its infancy, with most of the substantive assets still being captured by players from outside of this region. This must represent an opportunity for the progressive ASEAN players,” said Dato' Mohammed Azlan Hashim, Chairman, Labuan IBFC Inc, and former Executive Chairman of the Malaysian Bourse, Bursa Malaysia Berhad, in his keynote address. “Against the backdrop of continued growth within the region, the provision of wealth management solutions tailored from a multitude of domiciles, including home grown ASEAN-based jurisdictions, such as Labuan IBFC, is no longer rare,” he added. The Summit was co-chaired by Yuri Bender, Editor-in-chief of Professional Wealth Management and Jeremy Grant, Asia Regional Corporate Correspondent, both from the Financial Times. From left: Yuri Bender, Editor-in-Chief, Professional Wealth Management presenting a token of appreciation to Dato' Mohammed Azlan Hashim, Chairman, Labuan IBFC Inc. Standing in the far right is Saiful Bahari Baharom, Chief Executive Officer, Labuan IBFC Inc. Videos and photos of the Summit will be available on the event website at www.ft-live.com/labuanibfc. Live tweets of the event can be found under Twitter hashtag #FTLIBFC. The Financial Times, one of the world’s leading business news organisations, is recognised internationally for its authority, integrity and accuracy. Providing essential news, comment, data and analysis for the global business community, the FT has a combined paid print and digital circulation of 690,000 (Deloitte assured, Q3 2014). Mobile is an increasingly important channel for the FT, driving 60 per cent of subscriber consumption, almost 50 per cent of total traffic and 20 per cent of new digital subscriptions. FT education products now serve two thirds of the world’s top 50 business schools. For news about the FT, follow @FTPressOffice.